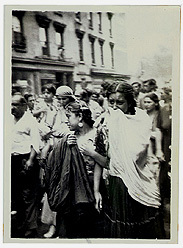 Several groups, all known to outsiders as "Gypsies," live today in the United States. In their native languages, each of the groups refers to itself by a specific name, but all translate their self-designations as "Gypsy" when speaking English. Each had its own cultural, linguistic, and historical tradition before coming to this country, and each maintains social distance from the others. Two subgroups of the Rom, the Kalderash ("coppersmith") and Machwaya ("natives of Machva," a county in Serbia) appear in the photographs in Carlos de Wendler-Funaro's collection. 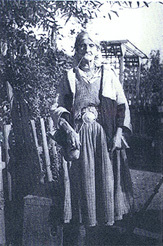 De Wendler-Funaro identified some, but not all, Kalderash as "Russian Gypsies." Another group he identified as "Russian Gypsies" seem to be the Rusniakuria ("Ruthenians"), musicians and singers who settled in New York. horse-traders. After the rapid decline in the horse trade following the First World War, most Romnichels relied on previously secondary enterprises, "basket-making," including the manufacture and sale of rustic furniture, and fortune-telling. Horse and mule trading continued to some extent in southern states where poverty and terrain slowed the adoption of tractor power (Salo and Salo 1982). 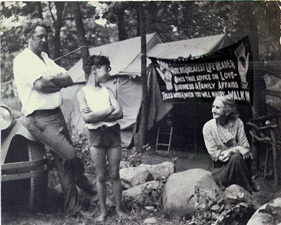 Gypsies from Germany, whom de Wendler-Funaro refers to as Chikkeners (Pennsylvania German, from the German Zigeuner), sometimes refer to themselves as "Black Dutch." They are few in number and claim to have largely assimilated into Romnichel culture. They are represented in de Wendler-Funaro's photographs by a few portraits of one old man and briefly referred to in the manuscript "In Search of the Last Caravan." Hungarian musicians also came to this country with the eastern European immigration. In the United States they continued as musicians to the Hungarian and Slovak immigrant settlements.